Tuck into a European 2 course lunch for just £9.50 per person! Available Tuesday to Saturday with last orders being 2pm. Offer not available throughout December. Book online for free text confirmation or call 01332 424 431. 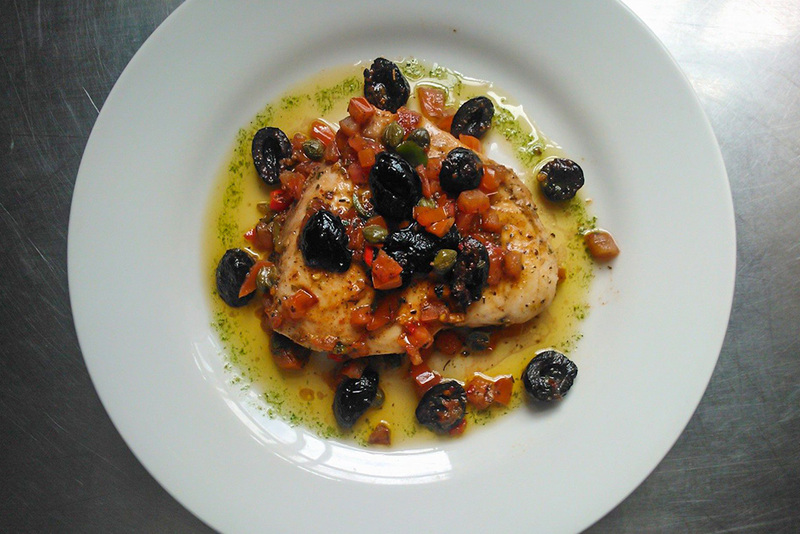 Enjoy 2 courses from the Italian-inspired early diner set menu for £11.50. This offer is available Monday-Thursday when seated between 6pm and 7:30pm and Friday-Saturday when seated between 6pm and 7pm. Please note this offer is not valid throughout December. Book online for free text confirmation or call 01332 424 431. Bring your party to the European and enjoy 2 delicious courses for £15 per person, or 3 courses for £19.50 per person! Book online for free text confirmation or call 01332 424 431. Excellent food and excellent friendly service. Very enjoyable! Lovely food and good service. 16th century building contributed to a very pleasant ambience. Can’t understand how we’ve not discovered this place before. We’ll definitely be returning. Fresh food , well presented. Excellent food and service and staff are very welcoming. We have been many times and can't fault it. The food was consistently tasty, adequately portioned and attractively presented. The rigatoni was especially nice. The service was attentive and friendly without being obtrusive. The setting is slightly unusual - upstairs in quite a tight area - and the decor plain. A slight disappointment was that GoDine gave us to understand that we would be able to have the Valentine's Day menu when it wasn't available. A small thing, though, cos the food was very good. Just as good as ever. Enjoyable meal, good value and lovely food. We enjoyed a birthday meal with incredible service, thank you! A friendly ambiance. Good service. Good food . Would visit again , and also recommend to others . A pleasant restaurant with a quirky waiter. As soon as you walk into this restaurant, the feel of the place tells you that you are in for something special and you wouldn’t be wrong. The staff are very friendly and make you feel very welcome from the off whilst the menu gives you a choice of food that would be suitable for everyone. The food was absolutely stunning, very very tasty and well cooked and in just the right proportion and, unusually for us, we had 3 courses because the food is that good. I would certainly recommend this restaurant and will certainly be returning. The meal was first class five stars and service was excellent five stars a brilliant place and you’re service is first class too I’ll recommend both to all my friends and family and all my customers too well done. We saw the deal for a two course lunch for £9.50 and thought it sounded good so we gave it a try, and we weren't disappointed. We arrived to a friendly welcome and were shown to our table. We ordered our drinks and were left to mull over the menu which had a good selection for each course. It didn't take long for the starters to arrive and they were beautifully presented and tasted lovely. The main was just as good, well presented and cooked well with a decent size portion of potatoes and veg to accompany it. It was a lovely relaxed atmosphere in the restaurant and the service is second to none. We would recommend the European to anyone and will definitely be going again. Genuine character as waiter, passion for the business and the food, which was top drawer. Fresh distinctive taste, oozing quality. Price more at the premium end, but worth it. Not disappointed. Have been going for several years and will continue to do so. Food, as usual, high standard. Always excellent food but portions a little on the small side. The meals that we ordered where fine, well presented and without a long wait between courses. Our party sat in a window seat overlooking the cathedral, watching the rain come down. We will visit again in the near future. Perfectly cooked traditional Italian food, very good service and cosy environment. The high Hygiene rating (5) adds another star to the review for, the commitment in delivering safe food. Definitely recommended. Lovely food,really enjoyable and a nice ambience. Very quiet being early January but the food was very tasty, over £60 for two including wine is only average value. Excellent value, fabulous food and friendly service. Will definitely return and recommend to others. Lovely food, just the right sized portions. 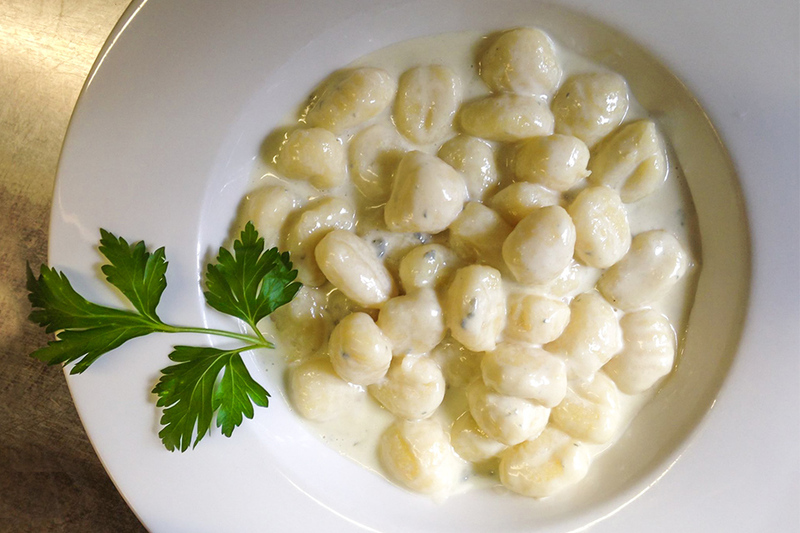 Gnocchi with Gorgonzola sauce was delicious. Very good service. Nice atmosphere. I enjoyed my meal (Pollo Sofia, and Chocolate Cheesecake). My dining companion said that her pasta was "bland", although she did enjoy her ice-cream dessert. The service could have been a little more attentive. Delightful restaurant, set in an old quirky building. Meal was excellent and the service very good. Always a pleasure to dine there. Very good food and enjoyed seeing chef who was genuinely intrested in making sure our meal was to our liking. Even good some cooking tips from him! Good food as usual. Service a little too slow. Very nice and relaxing place to eat my first time at the European, find the food and service very good. An excellent meal. The service was attentive and efficient. Really good meal, we had the duck, sea bass and black spaghetti with seafood. And it was all lovely with excellent service. Very friendly. Will definitely be returning. Excellent family night out. The service was superb and the food was top notch! Good food and setting. Slightly slow service which could be an issue if you were in any sort of a rush. I visited the restaurant on Friday 24th February in the evening and had a very nice table at the window. The food was excellent, my wife had a steak which was perfectly cooked and I had tortellini with an arrabiata sauce. This was delicious and was not too fiery! A lovely evening with great service. first visit but very impressed. Excellent value 3 course valentine meal. Food was exceptional, Lamb was tender, steak was equally so. Size of portions was good too, we didnt feel rushed and the whole night was worth the cost of £30 each. We had the early bird meal at the European, which we took as 2 starters and 2 main meals. We both had the mushroom starter, which was delicious, followed by me having the fish and my partner the chicken. The fish came in a creamy lemon sauce with crisp vegetables and the chicken was in a red wine sauce with crisp vegetables. We ordered a bottle of white wine with table water as well. At the end of the meal we both had a Baileys on ice, which was fabulous. We were made to feel really comfortable and there was no sense of being rushed. We will most definitely book there again. A very enjoyable evening. I have been here a couple of times now, and its great food, served well, and where you are allowed time to chat, without interruption. Thanks again! Amazing restaurant with amazing food. Friendly staff. Intimate restaurant. Keep returning and never disappointed with the European. Food was amazing at the European! Even though heavy traffic was causing all the guests to arrive late, the staff coped admirably. The food and wine were superb and the service excellent. The room was a little cold. The food excellent but I feel the portion size (Veg) was a bit on the small side for the main meal. Would definately go again. We have not been to the European for over a year and it wad lovely to return food still as good as ever and Jacko's singing still amazing cannot fault the place always welcoming! Excellent food which was also different from the norm. We really enjoyed our lunchtime experience. The service was good and staff were friendly. Would highly recommend it. Good service and good food. at the European! A very good dinner at The European, enjoyed with friends. 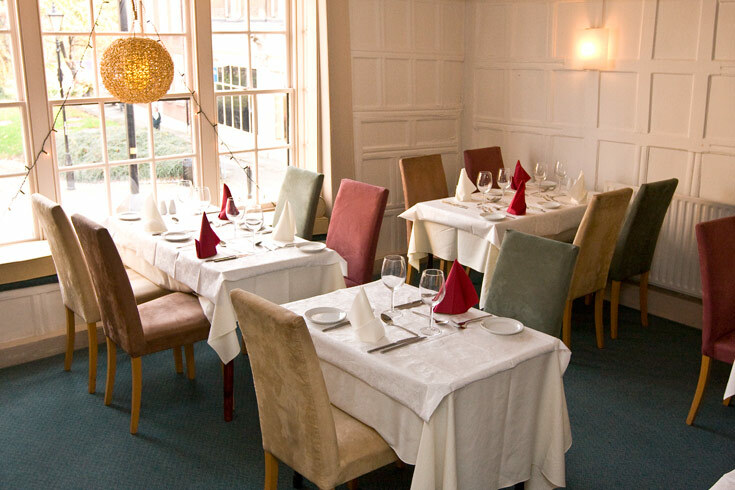 All of us agreed that the early evening menu at £11.50 for 2 courses was excellent value for money. Also very attentive, professional service. The Abruso wine was excellent! We were a party of 15 and were seated in our own room which helped create a great atmosphere. The food and service were excellent at The European and everyone agreed that we would return for future team meals here! 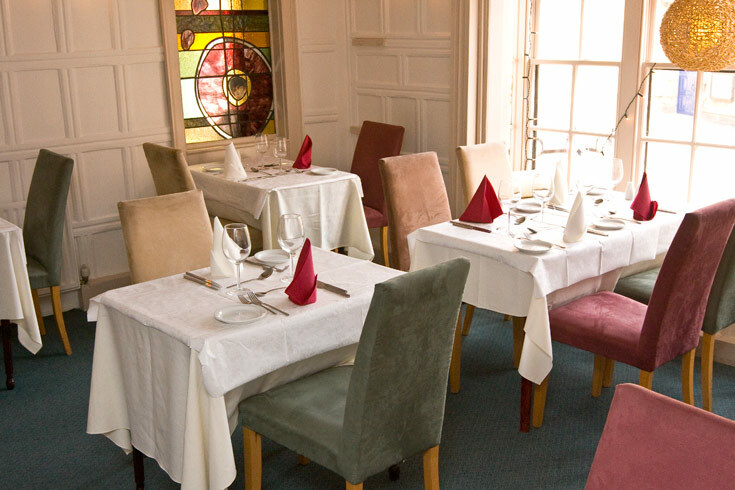 An excellent place, serving lovely food at competitive prices. 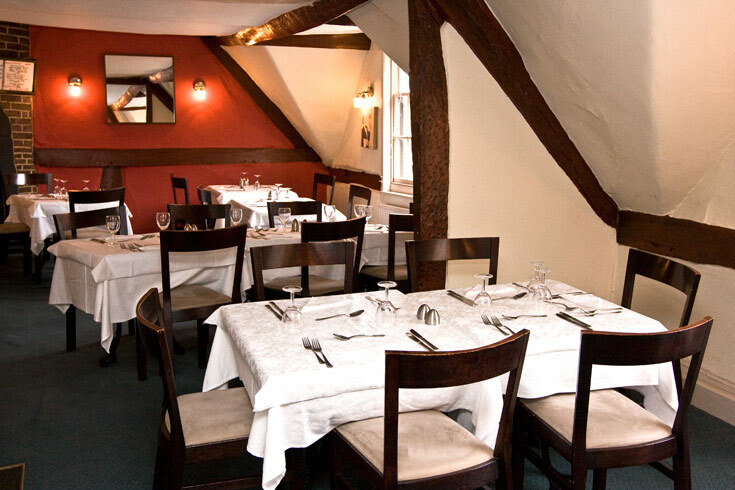 The European Restaurant has a lovely atmosphere, fantastic food and excellent service. We have eaten here many times and have never been disappointed. Great value, lovely food! Highly recommend. The food was absolutely superb, two pasta dishes and two meat dishes all with loads of flavour. Nice friendly service, best Italian in Derby. Very good food in simple surroundings with an attentive waiter. The view of the Cathedral is a bonus! Would recommend The European without hesitation. Menu was simple but full of good choices, food was very good, well cooked and ample portion size with efficient service. Atmosphere was flat though and even though service was efficient it was just that. It was a really nice meal and atmosphere could of had a few more potatoes. Excellent meal all round at the European, will definitely be going again! Food was very good. Service was quick until the end when they forgot to come and take our payment. A minor error in the light of the very good meals all four of our party had! The meal was very nice! Food was decidedly average with the exception of my Stilton brûlée which was really good. For us the room was a bit to bright making the candles pointless. Service was friendly but a bit rushed as was the pace of the meal. I have had good food and a good time here before so wouldn't want to put anyone off from trying it but for a special occasion (Valentine's) I was disappointed. I enjoyed the whole meal at The European from starter to main to dessert and the service was excellent also! The European is a lovely little restaurant, friendly staff, delicious food, would recommend and return! The restaurant was first-class and I would certainly recommend to friends and colleagues. I would definitely visit again with clients/customers. Loved it! We will return very soon. A last minute change of venue due to a gas leak meant The European being a replacement substitute, but certainly not 2nd class in quality, style and service. From the delicious sauce with fillet steak to the green spaghetti in the seafood main, all perfectly cooked and presented with panache. The European is a lovely venue for sharing a meal with loved ones and friends. Service was excellent and friendly. Food was of high standards and very enjoyable. The atmosphere was just perfect. It was probably a bit too expensive but I would still go again. Really pleasant and enjoyable experience! Great welcome food cooked to order at the European Restaurant, fantastic setting, really enjoyed the whole experience! Visited The European Restaurant for my Wife's birthday. We have lived in Derby for many years and did not even know that this gem was here! The food was excellent although a little pricey. We will revisit but for an earlier set menu. The A La Carte is ideal for a special celebration as you do expect to pay more for that, the atmosphere was quiet, relaxing and intimate. My wife and I loved it! Good food at the European and friendly service. Had early bird meal which was good value! I love this restaurant! The food is delicious and freshly prepared and the lunchtime deal is difficult to beat. The house wine is perfectly acceptable and you would find it difficult to beat Giancarlo's service and cheerfulness - he's been there almost 25 years, so he knows what customers like! Totally awesome!! Fantastic value for money, fantastic staff, fantastic restaurant, totally recommended 10/10. We had our works Christmas meal night at The European. Parsnip & Maple soup delicious , Turkey, Chicken & salmon mains great. However my husband had the Beef fillet Medallions coooked medium rare & said it was the best beef he had ever had. Christmas pudding was yummy too. Good selection of meals and drinks. All our food was tasted excellent and the house wine was perfect. Very nice and unhurried. Very attentive service and quite good food was spoiled by excessive costs for extras. We were celebrating a birthday with some friends & had a lovely meal with nice Italian flavours, good service lovely Prosecco in nice surroundings. 2 in our party were Gluten free and were catered for so all round a good night. This restaurant is consistently good. Lovely table by the window overlooking the cathedral. Food was excellent and great value. Highly recommended European Restaurant. We went for the pre-theatre early evening deal, lovely old building and nice restaurant room, lovely old chap that waited at our table. Food quite good, I had mushroom piazziola for starters, I didn't realise this was pasta so ended up having pasta for maim as well. All 4 of us then had dessert, my tiramisu was nice but not fab, my friend's sticky toffee pudding was the best I've ever tasted and my daughter had vanilla ice cream with espresso coffee poured over, which was also delicious. The best gluten free pasta in Derbyshire! You will not be disappointed. My family & I love this place - We cannot recommend it highly enough. Friendly helpful staff, a good value pre theatre menu with nice sized portions. Will definitely go again and have already recommended it to friends. This is becoming a favourite. I think we will be going again. Excellent meal. Very relaxed atmosphere. We did have to wait for a while to get seated. Our meal was booked for 8pm. We were not shown to our table until 8.30 with no apologies for the delay. Lovely little place. The staff where really sweet and the food was delicious. Thanks. The portions were rather small and there wasn't enough vegetables. The meal was excellent in every respect - as always at The European. Very pleasant meal though a little limited in choice for vegetarians. Good value with £10.50 menu. A very nice Italian-run restaturant. The food is wonderful! The best food I have had in Derby. I think it is run by an italian family and you can tell. Good food, wonderful eating area, not too crowded but value for money let this restaurant down. Walked passed here so many times and never ventured in, glad we did! The four of us sat in the window and loved everything about it, really felt welcome and the food was fantastic. 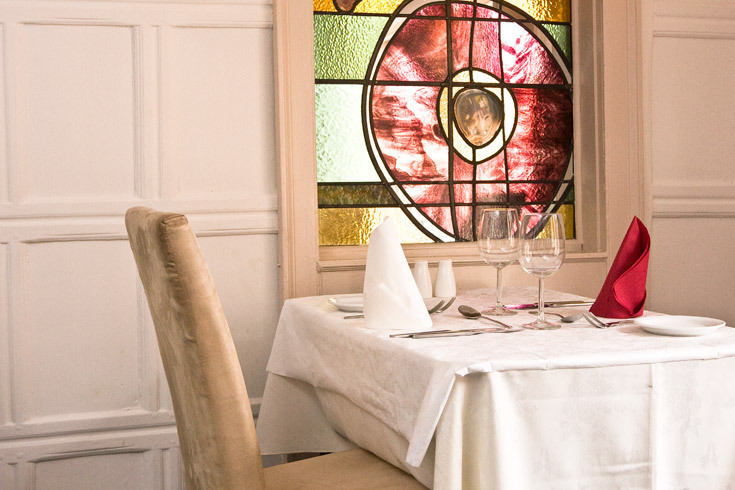 Situated in one of the most pleasant areas of Derby on Iron Gate, opposite the Derby Cathedral, is The European Restaurant and Bistro. 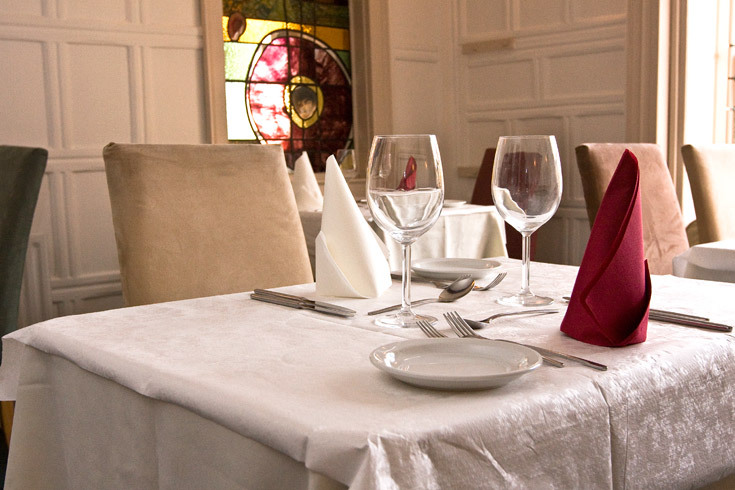 Situated on the second floor of one of the Cathedral Quarter’s most beautiful old buildings, this venue is ideally located for those who need to recharge after a day’s shopping or sightseeing, pre-theatre or simply for a romantic evening meal. 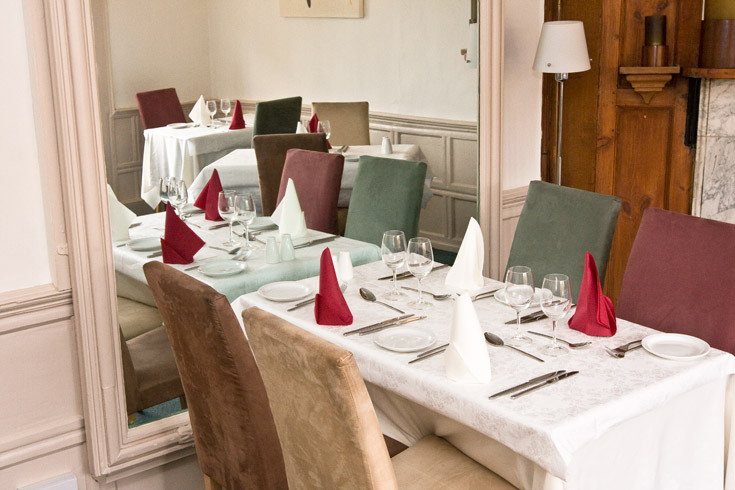 The restaurant offers guests a choice of two dining experiences; formal or informal. The additional of the casual bistro-style dining room allows diners to suit their dining to their mood. The bistro is fashioned with French and Italian living in mind; contemporary but with a twist as the vibrant red and monochrome colour scheme helps to create a lively atmosphere to enjoy with friends or family. 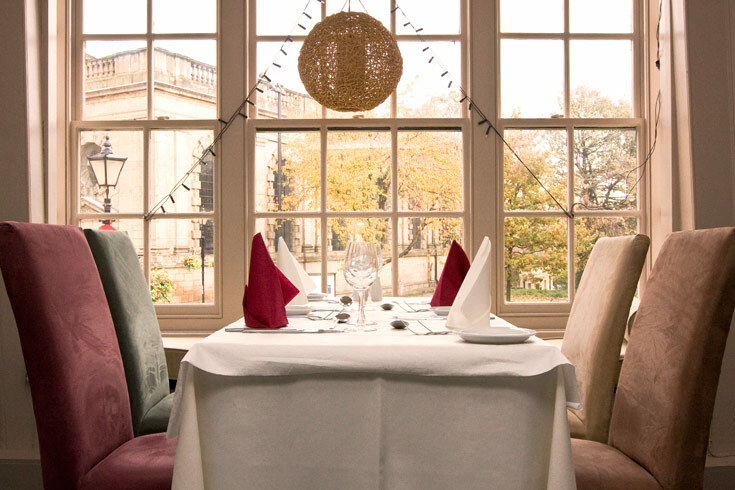 The main restaurant is classic and chic with a muted colour palette, multi-coloured chairs, crisp white linen and a quirky stained glass window. A delicious Continental menu is on offer featuring classics from across Europe. You can expect to find dishes such as spaghetti del bucaniere with mussels, white wine and diced tomatoes, duck breast with a rich wild berry jus, and specials such as pan-seared lamb loin with a port and rosemary sauce with sun-blushed tomatoes on the a la carte menu. The bistro menu offers similar dishes, with the same care and attention applied to every meal. With a good selection of pasta, meat and fish dishes as well as several superb vegetarian options thrown in for good measure, you are sure to find something to suit everyone’s tastes at The European. This delightful restaurant in the heart of the Cathedral Quarter is perfect for wining and dining, any time of day. It is more than capable of catering for large parties, as well as providing an intimate and welcoming atmosphere for couples and smaller groups. 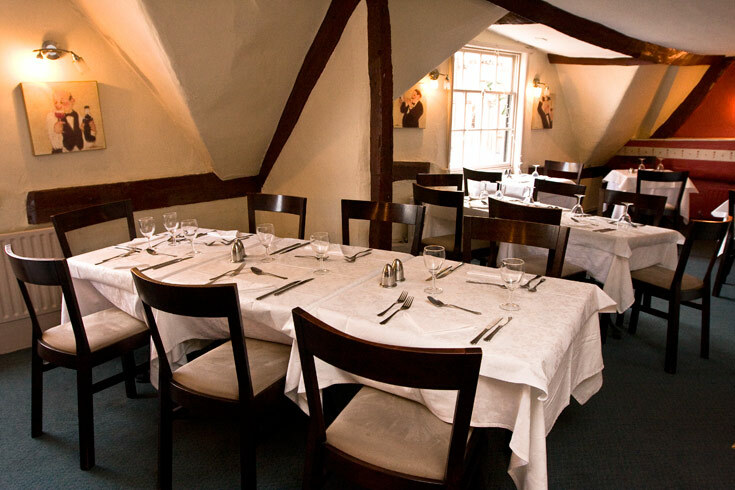 If you’re looking for something special, The European Restaurant in Derby ticks all the boxes. 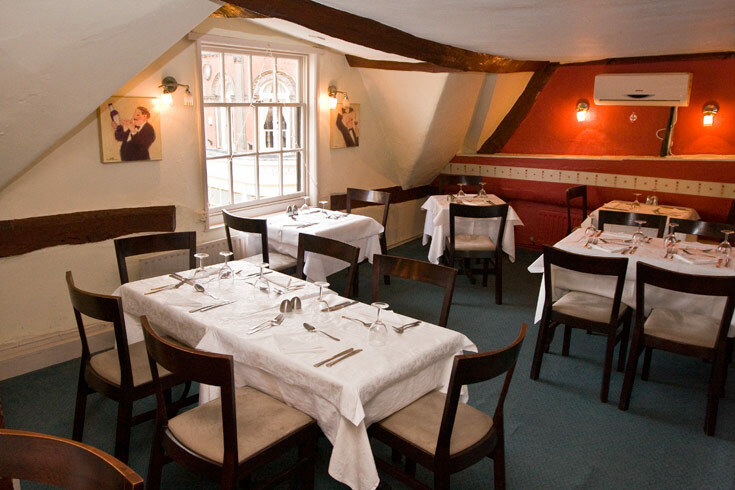 Tuck into a European 2 course lunch for just £9.50 per person! Available Tuesday to Saturday with last orders being 2pm. Offer not available throughout December. Enjoy 2 courses from the Italian-inspired early diner set menu for £11.50. This offer is available Monday-Thursday when seated between 6pm and 7:30pm and Friday-Saturday when seated between 6pm and 7pm. Please note this offer is not valid throughout December. Bring your party to the European and enjoy 2 delicious courses for £15 per person, or 3 courses for £19.50 per person!